The season started with Southport in tremendous form. They took nine points from the first six games and led the table. Peter Mee, a 22-year-old signed from Manchester City, scored the only goal credited to the side in each game. Mee played in thirteen games at inside-left before his mysterious disappearance on November 5th; the following month he was found drowned in the River Mersey near Sale Golf Club—an unfortunate end to a promising career. 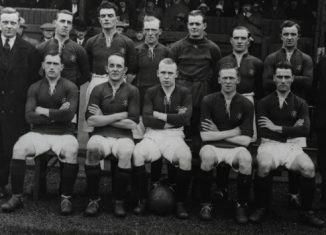 During the early part of the season former Irish International Jimmy Mulligan arrived from Manchester City and came into the side at left-back, to accommodate him Jimmy “lodger” Tootle, a diminutive but powerful defender who, due to his unorthodox methods, became a great favourite with the crowd, moved across to right full-back. After the early season flourish the club fell away and had to be content with seventh place. Once again the striking power of the forward line left a lot to be desired. Without Mee it had little to offer, although Jack Sibbald, signed the previous season from :Stockport County, showed great improvement and was top goal-scorer, notching a hat-trick at Barrow. The Reserves rejoined the Lancashire Combination after a twelve-year absence and celebrated by finishing second in the League with 48 points from 38 games and winning the Combination Cup. early the following season, aged only 19. Centre-half George Bettis later won a regular place in the senior side, and was transferred to Wrexham in 1926 for £150. Ultimately he assisted Burnley for several seasons with much distinction. One further occurrence is worthy of note. In June. 1923, the club acquired a junior clerk. The Registered Office was then in London Street, and it was there that he learned his trade under the tutelage of the Secretary. Edwin Clayton. His name was Gordon Hunt.